New circumstances call for new understanding: Through the disruptive force of the digital transformation, retail is on the verge of great structural upheaval. How will the Mercedes-Benz dealership and its environment (call center, etc.) look in the future? How will employees’ everyday work and customers’ purchasing behavior change? How well can new digital possibilities be used to continuously improve retail? 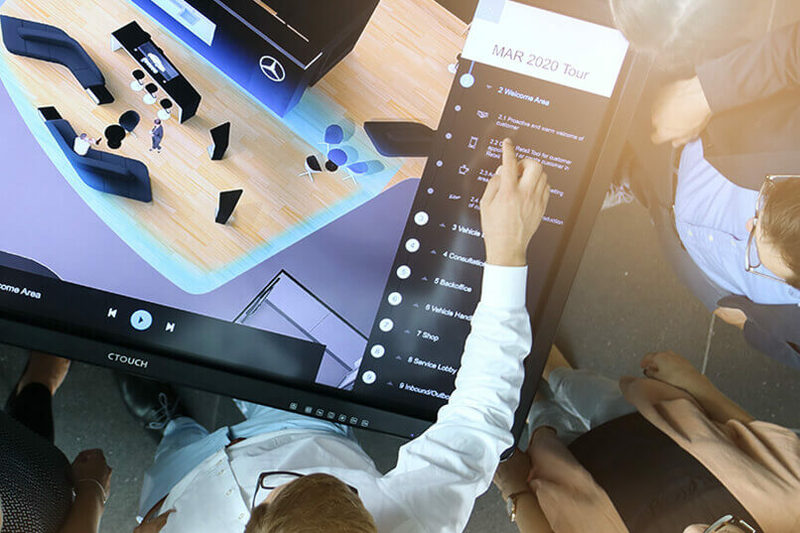 To find approaches and solutions, Mercedes-Benz Consulting has developed a digital tool that simulates the dealership and city of the future: the Virtual Retail Lab. 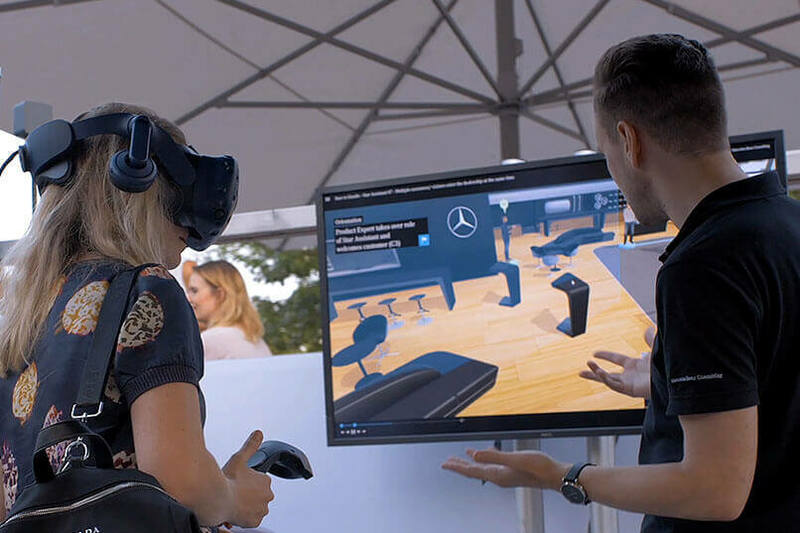 Using Mercedes-Benz Consulting’s proprietary Virtual Retail Lab (VRL), retail and its environment can be experienced and tested live. Based on computer game technology, the VRL shows a three-dimensional virtual city, including a dealership, call center, banks, customer homes, etc. With stored job profiles, various architectural designs and processes, the business of the future is brought to life as a game. Current and future scenarios and processes are shown both from the customer point of view and from the employee and IT system perspective, can be understood better and can be adjusted to specific needs. Anyone can interact with the future in a playful way. The tool opens entirely new possibilities. Whether in sales, after-sales, marketing, cars, vans or trucks, everyone can participate. In keeping with the motto, »Sharing is caring«, all fundamental content is bundled in the VRL. Knowledge is networked and grows continuously. What was challenging about the Virtual Retail Lab? In an extremely agile project organization, to develop a tool very close to our customers and that adds maximum value to the day-to-day job. You can see how important every sort of communication is. 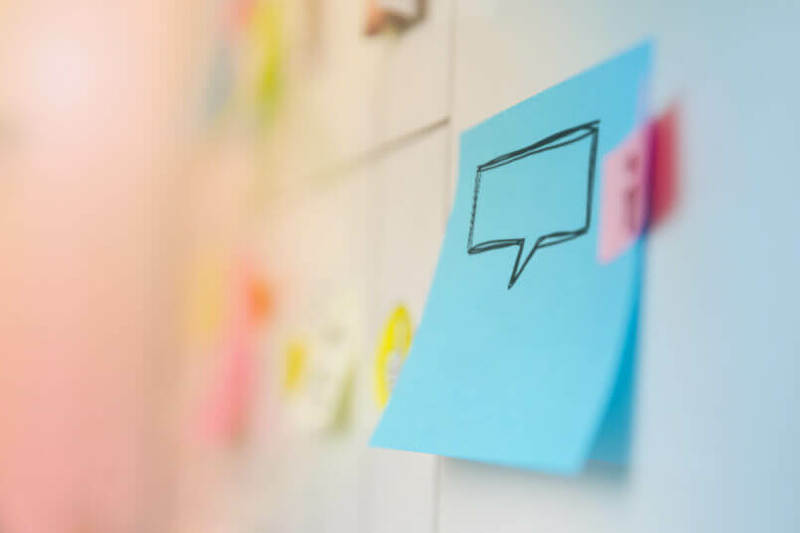 With the VRL, it is possible to explain things so simply and understandably that there’s no longer anything in the way of successful implementation. A good idea by itself is worthless. In innovation, the customer must always be the cornerstone. The prime directive is to seek out relevant problems that can be flexibly solved with a customer orientation. The Virtual Retail Lab brings about a platform that already allows people to recognize contexts, opportunities and risks, and to develop new solutions. In the future, we hope to use artificial intelligence to automatically simulate even more complex scenarios than we do now.